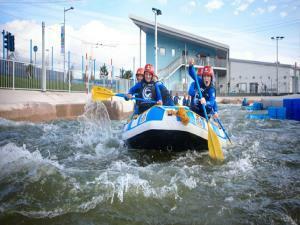 Canoeing at Cardiff Bay Water Activity CentreCanoeingCardiff Bay Water Activity Centre (CBWAC) has developed a strong reputation for running high-profile events alongside its main role as activity provider. Whether you are a water sports veteran or looking to try something new, CBWAC offers a range of water based options. Certified by the Adventure Activities Licensing Authority (AALA), Royal Yachting Association (RYA), Welsh Amateur Rowing Association (WARA) and recognised by the Welsh Canoe Association (WCA) and a key partner for the Welsh Yachting Association (WYA), the Centre in Cardiff Bay is run by experienced and qualified instructors working for Cardiff Harbour Authority. We offer, Rowing, sailing, canoeing, kayaking, climbing, powerboating, white water rafting, mountain biking - or if you can’t decide - a mix of everything!